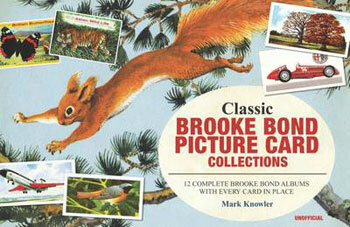 In April 2008 Carlton Books began the process of producing a Brooke Bond related book. Eighteen months later the result is this fine book which will appeal to both collectors and those with an interest in card collections. "This beautifully printed, nostalgic book presents the best 12 original albums, reproduced slightly larger than they were forty years ago to bring out the best in the wonderfully detailed illustrations. Collecting original Brooke Bond tea cards is a hobby that has a huge following, with serious collectors never daring actually to glue the cards into the albums as was originally intended - that would mean losing the information on the back and devaluing the card. In this book, however, you can see how each album was intended to look, with every card printed in its correct position, making every page an enormously colourful feast for the eyes. The albums that have been included are: "Out Into Space", "British Wild Life", "Wild Flowers series 2", "Freshwater Fish", "African Wild Life", "Asian Wild Life", "British Butterflies", "Wild Birds In Britain", "Transport Through The Ages", "Trees in Britain", "Flags and Emblems of the World", and "History of the Motor Car"."